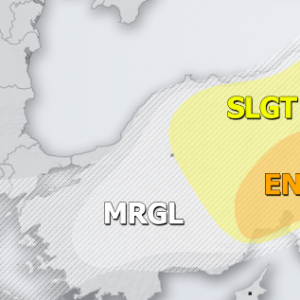 A period of warmer weather is coming for northern, central and western and parts of central Europe over the next few days, as a rex blocking pattern establishes over Europe. Daytime highs will be climbing higher over the next several days across northern and northwestern Europe. Northern Germany and Denmark and southern Sweden and Norway will likely climb close to 10 °C by the second half of the week. UK and Ireland will likely go above 10 °C, with some areas possibly pushing towards 15 °C, particularly in southern Ireland. Meanwhile, the Mediterranean region and southeastern Europe remain under the influence of a decaying cold core upper low, with temperatures cooler than long term average for this period. «Next Post Exceptionally deep cyclone Ana/Yves hits W France this morning – winds over 160 km/h reported!